SAP Business ByDesign is a complete and adaptable on-demand business solution designed to unify and streamline core business operations for midsize companies. The solution supports financials, CRM, human resources management, supply chain management, project management, supplier relationship management and compliance management. SAP Business ByDesign Reviews Recently Reviewed! Comments: For an all in one suite ERP, this is the best. Although some areas are not quite as robust as some would like, SAP really nailed it with this one. They address a huge span of customers with the one product, which is completely customizable if you want to spend the money. However, most of the time, companies find that they can walk with the product, no customizations for the first 6mos. Then they get a good feel for what they want to change. Pros: SAP took all of the knowledge gained with ECC, B1, etc. & published it into this cloud solution. You buy the license, and you have access to all modules. It is not a new charge to add in Project Management for example. You just turn it on. Online help documents are outstanding, and you can literally learn the entire software functionality by following them. With it being a cloud solution, you get auto updates every 3mo, which is nice. It updates some of the default government fees, for all of the countries you have in your system. Expense reporting for example. There is very little administration needed to let the software flow once you turn it on. And the best part is that you just need internet to access the software. Cons: It is for mid-size businesses. So for larger organizations, the licensing can get pricey. There is a limited amount of knowledge in the field on the product, so it can take some time to get answers for some topics from the partners, or to find info online. Comments: I have been working with this product for almost 2 years now. Most of my knowledge is self-taught from the online documents. This system is as robust as you wish it to be. The thinking has been done. Language packs, which apply in all modules, Country-specific financial rules that are updated constantly (IRS Guidelines for Expense Reporting for example), auto calculations, multi-currency use within one transaction. A counter part in Germany can operate in German, while all of mine can be in English when I am troubleshooting their issues, I think is outstanding. SAP is constantly updating, they have a great team backing the product, it is very personable user experience in my opinion. We use it for Order to Cash. We use the Supply Chain set up, full Financials. Production of Materials, Purchasing, Customer Service, just not POS. Although it has the ability, our business does not operate that way. Pros: The process is built in, it is native to the operation of the system. SAP's been in the business long enough to be able to take all of the success from Enterprise ERP applications that they have built, and merge this into an online application. The product is very versatile for what I would think many styles of business. I personally enjoy the idea of not having to program the system to react a specific way, I work through the process in a test, using the online documentation, some time with an SAP Partner (Consulting Company), but the hours spent there are little. We also have the additional SDK, so we can write some personalization to the product if we wish to. The SAP Support tools are wonderful, there is probably too many resources to reach out to. Cons: Not available in HTML in the production environments yet. Some users have been testing out the HTML in the test tenants. It is completely different layout. We would love to be able to drag & drop attachments instead of having to browse to them. Recommendations to other buyers: I personally would recommend this product to anyone looking to upgrade or start out with an ERP / MRP. This tool is very robust, you can bring on one module at a time, and all different implementation partners know what they are doing, as SAP validates their abilities first. This is a very well-thought out product. SAP is one of the most trusted brands within the enterprise resource planning software industry. Pros: SAP is one of the most recognized and trusted brands within the enterprise resource planning (ERP) software industry. This is something covers all aspects of business relation model. Cons: SAP is a cloud based technology and initially it has targeted toward SMEs with 25+ users, the solution can be used by organizations with as few as 10 users. The ideal range is 25-500 users, but the cloud scalability should facilitate more users if required. Overall: SAP on-premise systems, human capital management (HCM) and payroll functions include payroll automation, core HR, talent management, HR service delivery, strategic workforce planning, workforce analytics, payroll, workforce deployment, employee file management, organizational visualization, and HR outsourcing. Business ByDesign CRM is often a starting point for SAP's cloud customers. CRM provides a relatively simple gateway for first time cloud adopters who can then add other SAP SaaS functions over time. Comments: It is a true ERP in the cloud, with all the advantages of being 100% web, it is a solution in HTML5, with which you can manage it 100% on your tablet or mobile phone. It has BI and CRM, that surpasses the traditional ERPs and with Hana accounts with very good operating performance. Cons: SAP does not do much promotion to the product, to success stories and not much is known about its strengths in what the cloud managed by SAP itself. I consider the ERP's weakness in advanced manufacturing functions, in the management of mass purchases and in the capacity of large batches of information. -As I enter invoice items while entering an invoice in SAP in the view all screen, I'm unable to enter a credit memo line item. To do this I'd have to go back into basic view, enter the credit memo, then go back into view all. Pros: I like the most about this software that is very practical and easy to use, its integrations are well design and is very useful to associate your clients and providers with their personal invoices. Also, very helpful to maintain the accounting control of your business. Cons: The customer support is very poor when they have to update the system, it normally takes 3 up to 5 days to finalize the updating process and this affects very much our business, I wish they could be more efficient in this matter. Overall: It has been (overall) very pleasant and we are satisfied with the final product, of course, we also think there're more things that can be fixed and enhance in order to offer a more complete product to their clients and thus attract more potential clients that can join their portfolio. Not as versatile or customizable as it could be, but it gets the job done. Pros: I like that SAP By Design made it possible to go from a low auditable system to a highly auditable system very quickly. There is a confidence level in SAP that is appealing to partners and customers. Cons: Because it is web based, customization options are limited. With that said, I've learned that is is preferable to conform to the kind of best practices inherent within BYD than it is to keep making things up as one goes along. Overall: It's a professional, auditable, secure system, and that value is more than the sum of its parts. Pros: The project of implementation is aligned to agile methodologies. This is important because you can achieve immediate results. First, you can use finance module in you first sprint and to continue with the next modules in the next sprints. You do not wait until the project is finished to start your operations. Cons: I have not found courses about SAP Business ByDesign in detail. On OpenSap platform only there are few courses and it is not enough to learn all modules. Overall: In general, SAP Business ByDesign has solved many manual operations and it has allowed to reduce steps, eliminate duplicated activities, avoid reprocessing and we have up-to-date all documentation. Cons: Sometimes when a lot process are running at the same time, the app just turn to slow. But I think is because our PCs are quite old. I use the industrial version but work for a retail company so that is a challenge on its own. Pros: I like being able to view all of the settings of an item on one screen and ability to customize setting such as restricting to specific vendors. Cons: I don't like that i can't view one style at a time but I believe that is due to the model that my company chose to purchase. We work with multiple sizes, it would be easier to view at a style level. Overall: Learning about purchasing items from over seas as well as charging customers and processing POs. My first system in the"real world"
Pros: 1)Great Interface, Amazing Accessibility and Document Flow from one module to another. 2)Scalable to all types of small to mid-size organizations having 1-1000 employees. 3)Easy to use and learn and has provisions with Work Centers for CRM, SCM, FICO, PMO and HRM modules. Cons: 1)Limited ability when it comes to specific module based requirements since it tends to be a generic all in one solution. 2) Has a very limited presence under the SAP Umbrella and very few people talk about it. Overall: Scalable Implementations ensuring happy clients. Pros: I like the customizability and the openness to the software. There is a lot of maneuverability within SAP that is unmatched elsewhere, which is largely due to the fact that modules are built in-house. The support team for SAP is immense, and having worked with two pharmaceutical giants, the one that used SAP had more power to implement new functions. Cons: The turnaround time on updates/upgrades is awful, there's just no other way to put it. You could design a new software from the ground up between updates. Overall: The program allowed me to easily manipulate orders for clients, whether large or small. There's always an ease of understanding of how the system works, although there is a significant training investment required before it becomes user-friendly. Pros: I use it every second day at work anyand it is so functional in the day to day running and record keeping of the business. Keeps recorded input safe as long as you don't forget to click on the save command. I use it to capture daily production reports, incidents and observations at work. Makes recording keeping easy and organised. Cons: Sometimes when I enter Actual hours in one of the tools we call ik34, it reads my hours as over where even when my hours are way less. I still haven't figured out what could it be that leads to that. Overall: I would definitely recommend it to big corporations to keep record of their daily business running and keep it safe and organised. Comments: Overall, a very robust and insightful ERP system that connects all departments and ensures workflows and processes are being done correctly. Pros: The fact that it's cloud-based is great for getting insights from any device, anywhere. Also, the extensive reports you're able to generate gives you great real-time data of your KPIs. Cons: The customer support could use a little improvement in terms of data migration and system implementation. Recommendations to other buyers: Make sure you partner with a company whose expertise is in implementing this software into an organization. Pros: You can track all transactions, who made them, time and date, to perform audits when needed, it is possible to keep a real inventory of the products we sell, provides reports that help in operations and daily budgets. It involves different areas of the company, such as marketing, accounting, sales, administration, finances, inventories, etc. Overall: The benefits obtained by this software have been saving time, money, paper, I have control over inventories, customer information stored safely, etc. Pros: It is a software that integrates the necessary modules to carry a company and integrates all the information. It is also very easy to use. Cons: Invoicing has some issues such as format is confusing for the client. Pros: Great program for asset management and accountancy. Cons: Interface error may occur in rare occasions. Ease of use rating most impressive. Very user-friendly product, and customer support is great. Pros: User friendly design makes this product easy to use for any business. Accomplish daily business needs for invoices and tracking. Businesses can get real time information on the most critical business metrics. Cons: Payroll is not a part of the SAP Business One solution and hence you need to purchase this from a third party. There is also often of perception of being too difficult to use for smaller businesses. Overall: Thanks to the automatic alerts facility you need not query the system for your information needs, but the system will ensure that the important metrics, which you have identified, are easily available to you. Pros: I used this as a CRM with one of my prior employeers. It can do just about everything you want it to for a CRM. Cons: I found that you had to click a lot while navigating the software which at times felt like too much. Pros: SAP is very good in creating tasks, has many, many modules, good cloud system, document flow, personalisation. Cons: SAP ByDeign seems to have been programmed by people with lack of accounting. VAT returns have no date or suppliers/customer names, they only show ID ref, journal red, any kind of reference except what you need to see. You are able to view these in another report after you have done VAT return! Payment runs and customer statements are the same thing, it throughs out report which you have to accept with no view of what is in the report, assuming that everything you put in it is correct in the first place. Very cumbersome, too many processes to do simple tasks. Very confused system! Pros: Able to customize the software as per the business requirements was something I needed and there you go I found SAP Business. Cons: Took me little time to get familiar with the product. But overall I love it because of the report creation and it is cloud based. Overall: I was able to automate certain processes in the business thanks to SAP. The best tool to manage your company. Pros: You can manage different areas within the same software (purchases, inventories, production, etc). Once you have parameterized the software and emptied the data within the program, you can have a total visual of the business management. Cons: If you are not clear about what you want to register, the software can become cumbersome. Sometimes it takes a while to start. You must have very clear the parameterization you want to do, if not ... it will generate incorrect data. Overall: Control of the entire management. Pros: this so nice and Ideal for small or medium-sized companies that have an important expansion and growth plan, and for large multinationals with plans for implementation in new countries. Pros: The ability to create material and vendors in the system and ability to print reports. Cons: It has limited functionality. It doesn't give the user the ability to explore it's use. Overall: It integrates different department hence brings harmony in operation of the firm. Pros: It is great for SCM but that's about the only thing. Cons: You have to click 10x before getting to the screen you need. It doesn't properly record revenue and doesn't offer a VSOE606 option for revenue recognition. If you're looking for an ERP you're better off using Netsuite. Overall: SAP overall is very disorganized. I do not recommend purchasing any of their software because they promise you the world and don't deliver. Look at SAP Anywhere and S4, both have been flops up to this point. Used this in a previous job for processing orders. Found it acceptable, but not amazing. Pros: - Once someone explains the basics of it to you, it's reasonably easy to use. - The documentation for this software is very good and allows you to find out how to do what you need to do quite quickly. Furthermore, if you encounter issues the customer service is very good and fast. Cons: - The user interface feels like it's stuck in the 1990s. I understand that it's more about functionality than appearance, but starting at it for a whole workday can be quite a gloomy experience. It doesn't feel like a nice 'atmosphere' to work in, and I feel some aesthetic improvements would vastly improve user experience. Overall: Allowed me to do my job smoothly and with little hassle. Pros: SAP has more than 40 years of best business practices built into the software. Then, to have a cloud-based product that reduces IT infrastructure, and keeps my business information where I need it, when I need it, is truly a win-win for any business. Cons: If there was one thing I did not like about SAP, it would be their time-to-market. They are consistently 6 months behind. However, I also think this is one of their strengths - which is to not bring a product to market before it is ready. SAP has always done well in this regard. Recommendations to other buyers: Do you research. Make sure your processes are in line with supporting an ERP. Ask yourself if your business is ready for ERP. If so, look at SAP. It is not just for big companies. It is for your company. Comments: I have been using SAP ByD for 2+ years now. We have the system in use for 3 separate companies, worldwide. We use the Fixed Assets module, Travel and Expenses, Cost Accounting, Manufacturing, Sales. It handles everything quite well. Pros: The thinking is done for us. Other software would require some background programming, this one has it all updated to the current government agency settings. Cons: The freezing on screens, when I try to run specific reports. Recommendations to other buyers: Worth the investment streamlined everything for us. Comments: I have used and configured many ERP systems and with out a doubt this is the worst system money could buy. Do yourself a favor and look elsewhere. Cons: Slow performance, terrible interface, not intuitive, not configurable. Crashes constantly. Poor online support, poor training guides. Ten steps to do one task. The service, HR , Marketing section are worthless. Good luck finding the correct design studio tools Absolute junk. Pros: I have found this product user friendly to use. I have gone through the training resources and when I hit the floor, their customer support set me on the right track. It really seems that the reporting possibilities are only limited by my imagination. As an added benefit, the price prospective. Cons: I look forward to have a reporting part should be in more detailed version. I need this reporting functionality in order to prepare for my team. I believe it should be in their next release. Overall: I believe overall this is the best software to use and understand and cost effective in terms of their ideas. Expect better customer support experience and new items added in their next release. 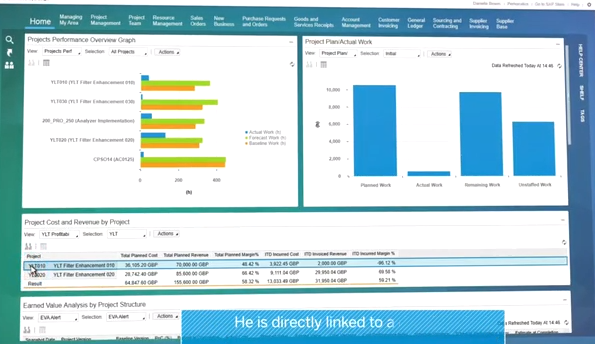 Comments: It's a one of the best ERP solution from SAP for small to midsized companies. It's cloud based ERP which reduces the implementation cost, and you can customize the way you like it, as well as flexible integration with other products. The UI is very user friendly too. Pros: Robust program, we use at enterprise level. Cons: Not intuitive user interface, unless you are a power user it is difficult to figure out how to do what you want to do with the software. Pros: Business By Design is a solid SAP Cloud ERP product. It is easy to set up and more suitable for smaller and medium-sized companies. Cons: At medium-sized companies, you will have many problems getting all the processes right. The expansion options are not designed for very large individualization. Pros: the most i like about this is that you can management all the Enterprise Resource, so that you can get better efficie. This program helps to find caps that we need names for. Pros: I like that it is pretty easy to use. I like that you can use multiple keywords to find what you are looking for. Cons: I wish it was updated a bit. If it had updated software maybe it would work a little faster than other programs. Overall: I am able to organize and format data for customer files and also partake in data clean up to update current customers.